Like Energizer’s bunny, Toyota’s Corolla just keeps on running through the generations and has succeeded like no other car model. It’s now 50-year run has resulted in more than 40 million Corollas being sold, most of any model. That’s more than the VW Beetle, the other long-term, low-cost people’s car. Corolla really owns that title now. Everyone has either owned one, or had a kid that owned one, or an aunt, uncle, step-child or, well, a family member that has owned one. Full disclosure, our family bought a new Corolla in 1983 when we had a 2-year-old and a second child on the way. It was reliable (we wisely decided against a Chrysler K car and Renault Alliance), economical, came with a stick-shift to help us save fuel and had a big enough trunk to hold a highchair and loads of diapers for trips to the grandparents. Today’s new Corolla furthers that high value statement while remaining highly reliable and actually a bit more stylish than in years past. Toyota has put some effort into styling the last few years and so the 2017 Corolla is more than just an econobox. It looks good and drives well while remaining affordable and economical to run. Let’s start with price. That’s what most of us think of as relating to value. A base Corolla L starts at $19,365 and the tested top-level XSE lists at $22,680, plus $865 delivery. 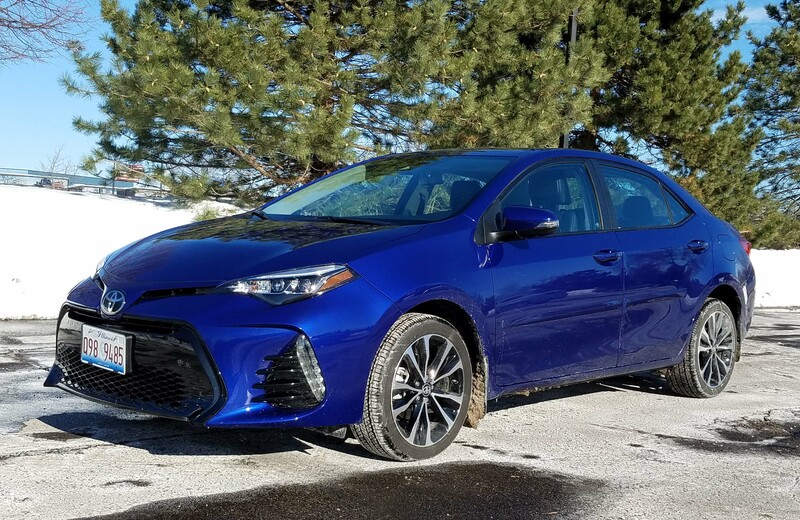 A few other brands have similarly priced models that drive a bit sportier, but Corolla comes with most everything a buyer would want, plus is laden with the latest safety equipment. Its Safety Sense-P is standard and includes adaptive cruise control, automatic collision braking, pedestrian detection, lane departure and steer assist, plus automatic high beam headlights. Also standard on all models are LED headlights, a rearview camera with path detection, air conditioning, cruise control, and a tilt/telescope steering wheel with audio and Bluetooth controls on the wheel’s hub. There’s also a 6.1-inch touchscreen, USB port and Toyota’s Entune infotainment system with Siri Eyes Free. Move up to the LE, starting at $19,800, and you get automatic climate control and an interior upgrade. 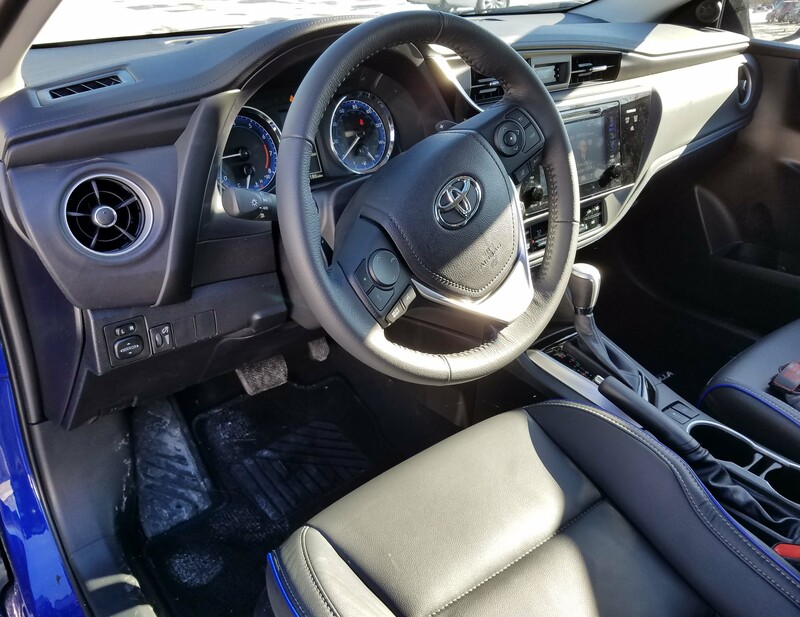 The XLE and tested XSE, both in the mid-$22,000 range, get push-button start, keyless entry, fake leather seating, a 7-inch touchscreen and an 8-way power driver’s seat. Fuel economy remains a strong selling point too. The tested dark “blue crush metallic” test car was rated 28 mpg city and 35 highway. I got nearly that in two separate drives with up to four people aboard. I managed 33.9 mpg in a mostly highway drive and 28 mpg in a mostly city drive. As gas begins its inevitable creep back toward $3 a gallon, these are persuasive numbers for young families looking to keep transportation costs in check. Driving the Corolla is totally predictable. It’s what you expect. The car has a light and easy feel and handles well. It’s easy to turn and maneuver and park. It corners well. Power is modest from the 1.8-liter I4. Horsepower is 132 and linked with Toyota’s automatic CVT transmission, works mostly to deliver good fuel economy. Acceleration is mild, but the CVT comes with a push-button Sport mode that allows the driver to pump up engine revs just a bit to improve acceleration. That means a noisier engine when you accelerate in Sport mode, but it helps boost the car’s performance a bit. Best used when facing a short highway on-ramp or when the car/truck behind you at the stoplight appears impatient and much quicker than you. Ride is typical of a small car, although with a 106.3-inch wheelbase I expected a bit better. Ride isn’t harsh, but can become choppy on our worst area roads. 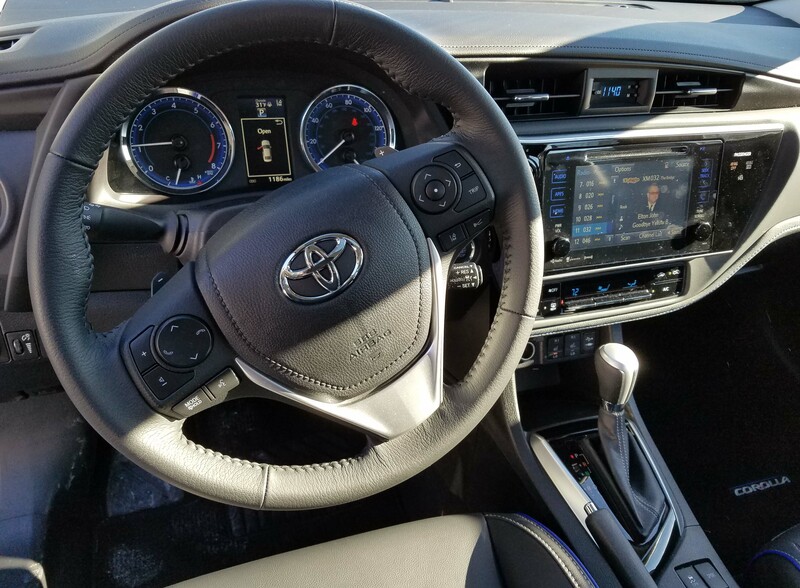 For 2017 Toyota has improved the Corolla’s interior, adding round air vents along with a new dash. That safety package and exterior styling also are new. There’s even a special 50th Anniversary Edition model with black cherry paint job and fancy 17-inch alloy wheels if you’re in the mood to celebrate. But mostly we’re just happy to have a useful, easy-to-understand interior with good dash gauges and screen. This had the slightly larger touchscreen, being an XSE, and it was simple to use with preset buttons down the left side with large enough surface area that you could easily punch them while driving. Most worked even when I was wearing gloves. Main dash gauges are lit in blue, which is easy to see and easy on the eyes at night. Other dash buttons were mostly lit, but the door panel window and lock buttons were unlit and hard to find in the dark. The test car had a black fake leather interior with blue piping on the seats and atop the door panels. Overall the interior felt too dark and could use a bit of lightening, at least making sure all door panel buttons are lit. Toyota added illuminated door sills here for $309, a nice touch. Other add-ons were minimal, including body side moldings for $209, carpeted floor mats and trunk mat for $224 and mudguards for $129. All-in, the test car hit $24,416, a modest price for this much car. Most impressive were the extremely comfortable supportive front seats that made the Corolla more comfortable than even many high-priced sedans I’ve driven. The fake leather feels fake, but is soft enough to be comfortable and the seat backs and bottoms are well contoured to support your thighs and lower back. This model includes an 8-way power driver’s seat, but no lumbar adjustment. The XSE also comes with 2-level heated front seats. And Corolla has a roomy interior. Two adults sat in the rear seat and both said they had plenty of leg and headroom. Overhead is a sunroof and there’s a rearview camera to help a driver when backing from tight parking spots. Sun visors do not slide here though, a Toyota oversight. Cargo room in back is good with 13.0 cubic feet available, plus, as you’d expect, the rear seat splits and folds flat. A few other minor points, for instance there are inside trunk and fuel door releases at the base of the driver’s seat. But they are reversed. The fuel release should be in front of the trunk as you use the fuel release lever more. Also, while the test car had but a single automatic climate control, the heater was quick to warm and blasted your feel to keep them toasty in winter. The XSE also comes with a navigation system, leather steering wheel and small rear spoiler. Note too that the various Corolla models feature different trim pieces to distinguish them. So an L or LE will not look exactly the same as an XLE or XSE with minor taillight variations, etc. 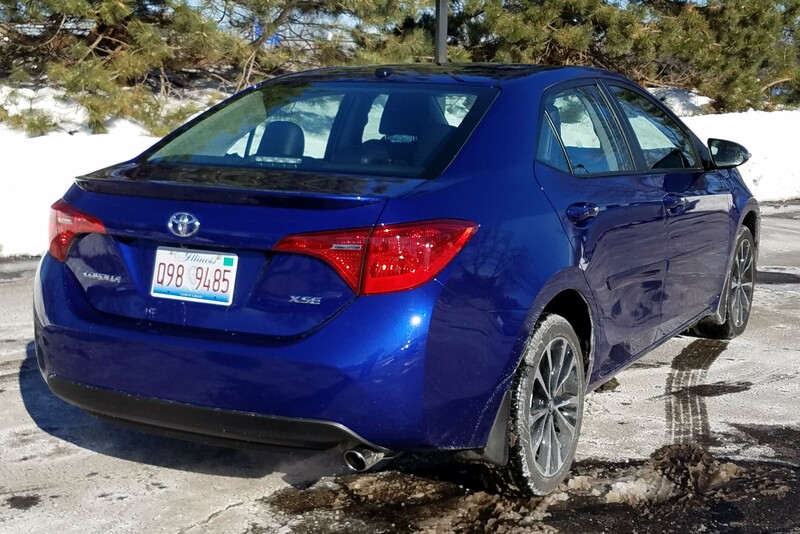 I’ll admit I like driving a few small cars more, the Mazda3 and Ford Focus come to mind, but from a pure value standpoint the Corolla remains one of the top buys for a small, family sedan. It likely will remain a top seller for years to come. 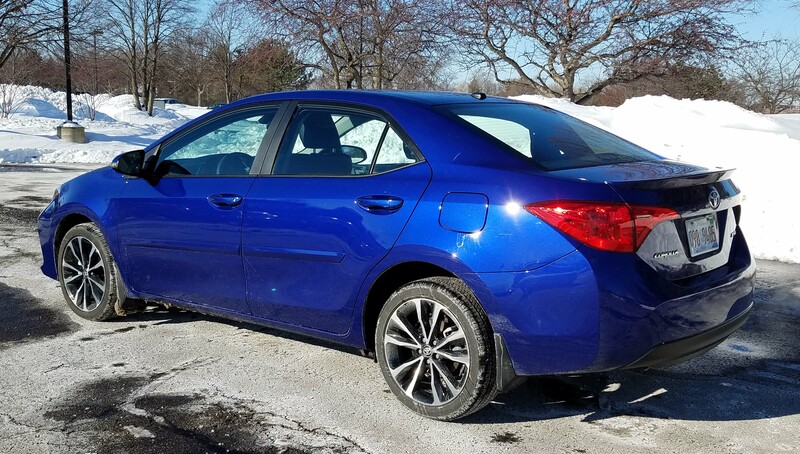 Hits: High value with great mpg, nice light small car handling, heated seats, sunroof, extremely comfy supportive seats, roomy back seat, blue dash gauges, power driver’s seat, backup camera and full complement of safety systems. Misses: Modest acceleration, dark interior, visors don’t slide. Ride just OK.
Made in: Blue Springs, Miss.